Short term Elliott Wave view suggests wave ((w) decline from 96.16 is in progress and taking the form of a double three wxy where wave w ended at 94.09, wave x bounce is in progress and expected to complete at 94.94 – 95.37 as a FLAT, then it should turn lower one more leg in wave y towards 92.74 – 93.4 equal leg area to complete wave ((w)). Alternatively, from 94.94 – 95.37 area, the pair can pullback 50% retracement to correct rally from 94.09 then go higher again in 7 swing to complete wave x bounce, but even in this alternate scenario, the bounce is still expected to fail below 96.16 for the next leg lower in wave ((w)) towards 92.74 – 93.4. From this area, the pair is expected to see a larger bounce in wave ((x)) before going lower again. We don’t like buying the proposed wave ((x)) bounce and expect the bounce to fail below 96.16 in 3, 7, or 11 swing. 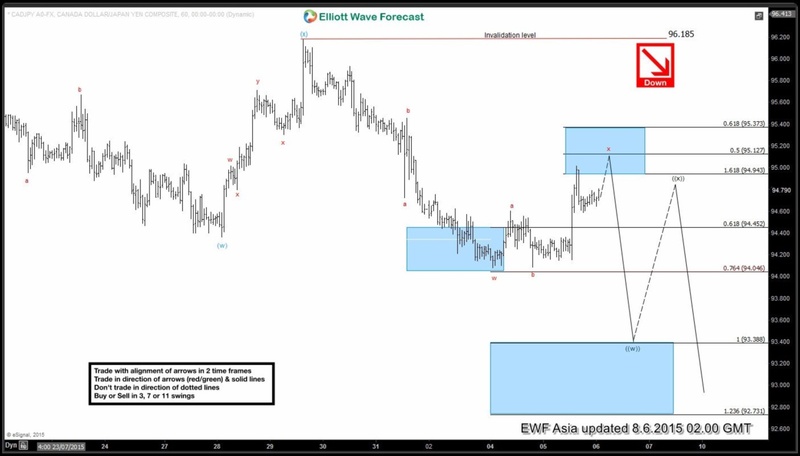 At EWF we offer 24 hour coverage of 42 instruments from Monday – Friday using Elliott Wave Theory as primary tools of analysis. We provide Elliott Wave chart in 4 different time frames, up to 4 times a day update in 1 hour chart, two live sessions by our expert analysts, 24 hour chat room moderated by our expert analysts, market overview, and much more! With our expert team at your side to provide you with all the timely and accurate analysis, you will never be left in the dark and you can concentrate more on the actual trading and making profits. Check out our 14 day Trial to sample everything EWF has to offer!